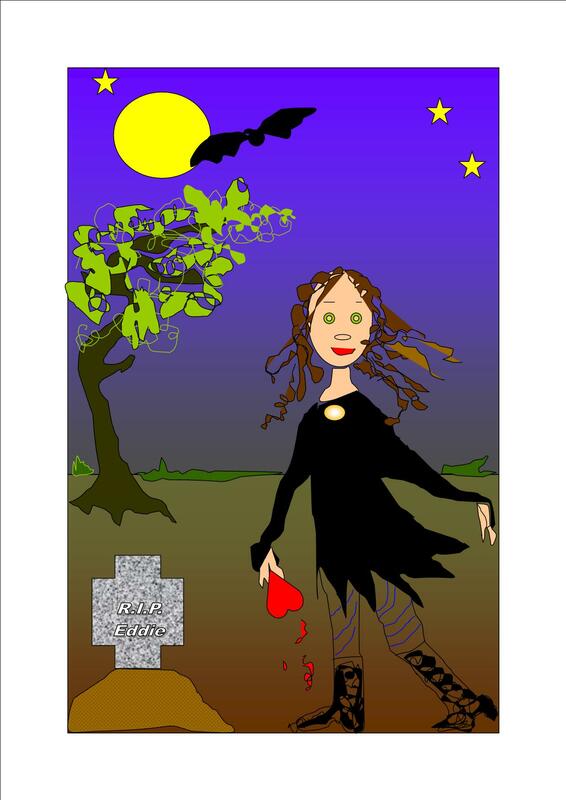 Not strictly speaking a creature of the night – in fact not really a creature of anything – the oak is one of the most important ingredients to my Willow the Vampire stories. Few species of plants have had as great an impact on human life as the oak tree and from the very beginnings of recorded human history, oak trees have captured humanity’s imagination, be it for religious, cultural or artistic reasons. 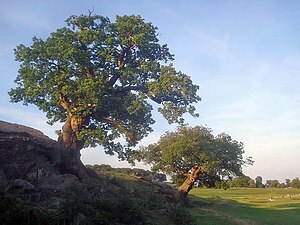 The oak can best be described as the land equivalent of the Great Barrier Reef in Australia. Oak trees are a haven for all manner of creatures, day time or nocturnal. The average oak is home to at least thirty different species of birds, more than 200 species of moths, probably various kinds of fairies and a minimum of forty-five different kinds of bugs. A mature oak also generously “donates” some 100,000 acorns a year to feed squirrels and various other creatures such as wild boar and domesticated pigs, bears, deer, birds and a variety of rodents. Wood pigeons are known to devour 120 acorns a day, while owls and bats use the cracks in the oak’s bark to make their home. Oak trees are incredibly long-lived and can, without the interference of mankind, live for thousands of years. The origins of oak trees are lost in the mists of time. Oaks are part of the family Fagaceae, which includes beeches and chestnut trees; oaks belong to the species Quercus Alba and together with cousins beech and chestnut their history dates back at least 100 million years. 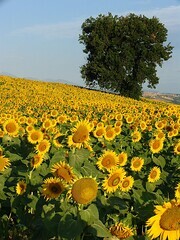 It is unknown where oak trees first came into being. The super-continent Pangaea began to break up around 250 million years ago, when it split into two gigantic terrestrial crusts, of which Gondwana (see Leipzig Zoo’s Gondwanaland) was the southern mass. This later broke up further into what we now know as South America, Africa, Australia, India and Antarctica. Laurasia was the northern half and this split further into Europe, Greenland, Asia and North America. Somewhere on this northern mass of land oaks evolved into the key flowering species that floated across the northern hemisphere together with the continents we know today. Oak trees used to be called the “Lords of the Forest” and in many cultures they are at the core of folklore and mythology, such as Dodona, which was the most ancient of all Greek oracles and was revered long before the rival oracle in Delphi ever uttered an enigmatic word. Some 4,000 years ago Neolithic farmers would gather under oak trees to worship their Mother Goddess, who communicated with them through the rustling of leaves. The Greek storyteller and writer Herodotus claimed a beam of oak had been used to build Jason’s boat The Argonaut. Never mind the Greeks, Willow and her friends are facing rather miffed Norse gods, so they need all the help they can get, creature or no creature! So far, oak trees have proven rather useful in the battle to save the world. Thor was symbolized by the oak because he was the god of thunder – oak trees, so our Norse ancestors had observed, were struck by lightning more often than other trees. Oak trees were often used as shrines and the older the trees were, the more worship took place under their branches. One of the most famous Norse oak shrines was Thor’s Oak, a very old oak tree that had survived for hundreds, perhaps thousands of years. Germanic pagans used to gather in Geismar in Northern Hesse, where the oak tree stood, and sought its protection against the misfortunes nature would throw at them. 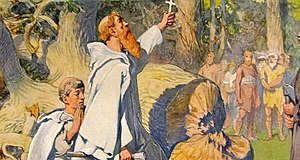 This continued until the year 723 when legend has it, the English Christian evangelist Winfried chopped it down to prove that Christ was the one and only God; rumour has it that the locals accepted Winfrid’s word and converted in “droves”, but it is far more likely they simply gave in to the ever increasing threat posed by brutal Christians. Winfrid later became Germany’s patron Saint Boniface and ever since Christians destroyed the Norse pagan religion which had nothing but veneration for nature, Mother Earth has been on a downward spiral towards total destruction. There are many oak trees in Willow’s garden and on Farmer Edward’s farm. Stinkforthshire as a whole is blessed with oak trees and Willow’s sacred grove is also a circle of majestic oaks. As Willow the Vampire and the Würzburg Ghosts unfolds, we shall see what further significance oaks have in the little vampire’s life. I never realized how many different animals relied on the oak tree, that is amazing, 200 species of moth, just mind boggling, I have no doubt that their are also fairies hidden in there somewhere. Thank you. Trees are my favourite things on the planet…except for kittens and puppies…and one particularly little vampire girl. Considering the age of some oaks, ever wonder if this is the only planet where they exist? They are very mysterious beings, I would not be surprised if they showed up on other planets. I always find Oak trees rather majestic. Me too, no wonder pagans worshipped them, they are far more mysterious and impressive than any old church humans could possibly build. Far more useful, too.